Malabar spinach is a tropical plant that tolerates neither frost nor cold soil. Mix in a balanced organic fertilizer when preparing the planting site. Asparagus. 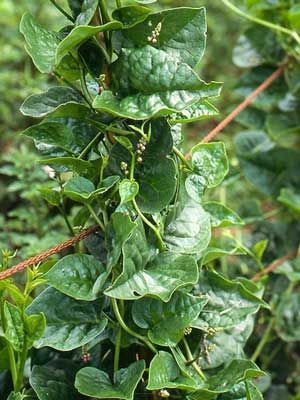 Malabar spinach is a vigorous climbing plant that needs a trellis or other support. It will quickly overtake other plants. Plant seeds in late spring, after the soil has warmed. In cool climates, you can give plants a two-week head start indoors. After the first season, look for volunteer seedlings and move them to where you want them to grow. Malabar spinach is highly ornamental, and is easily trained up a trellis. Some varieties have red stems. Malabar spinach is typically grown on a tower, fence or tepee style trellis. Four trellised plants will occupy a space 18 inches (45 cm) square at maturity. Clip leaves as you need them in the kitchen. When lightly steamed or stir-fried, the leaves resemble a cross between spinach and chard. In the fall, gather up dead plants and compost them to limit reseeding in the garden. In some climates, Malabar spinach can become weedy.